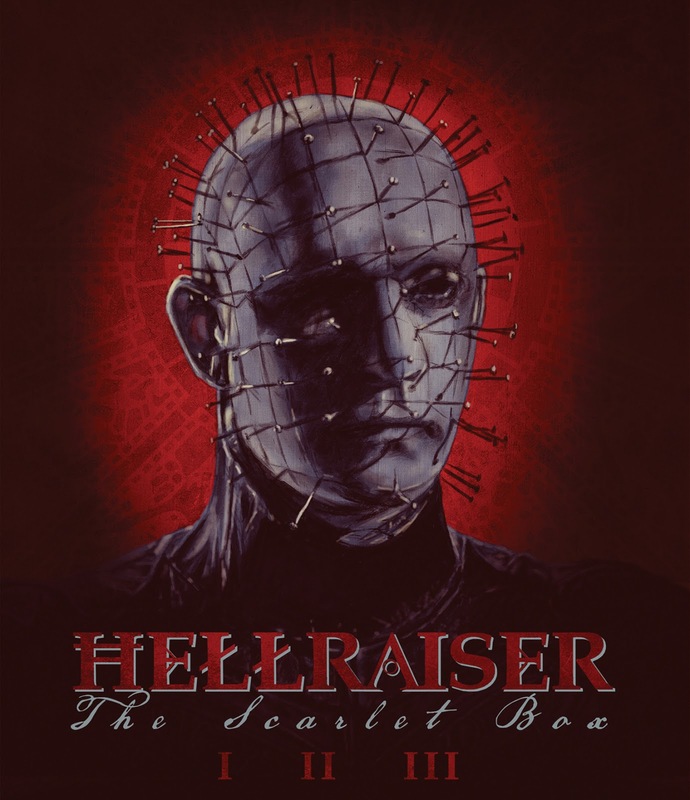 Film-Arcade.net: Arrow Video Unearths "Hellraiser: The Scarlet Box Limited Edition Trilogy"
Arrow Video Unearths "Hellraiser: The Scarlet Box Limited Edition Trilogy"
Arrow Video recently send us information that they will be releasing . The four disc blu-ray set includes "Hellrasier", "Hellbound: Hellrasier 2" and making its blu-ray debut "Hellrasier 3: Hell on Earth". Special features for Disc 1 "Hellrasier" includes Brand new 2K restoration approved by director of photography Robin Vidgeo, Audio commentary with writer/director Clive Barker, Audio commentary with Barker and actress Ashley Laurence, Leviathan: The Story of Hellraiser - brand new version of the definitive documentary on the making of Hellraiser, featuring interviews with key cast and crew member, Being Frank: Sean Chapman on Hellraiser - actor Sean Chapman talks candidly about playing the character of Frank Cotton in Barker's original, Soundtrack Hell: The Story of the Abandoned Coil Score - Coil member Stephen Thrower on the Hellraiser score that almost was, Hellraiser: Resurrection - vintage featurette including interviews with Clive Barker, actors Doug Bradley and Ashley Laurence, special make-up effects artist Bob Keen and others, Under the Skin: Doug Bradley on Hellraiser, Original EPK featuring on-set interviews with cast and crew, Draft Screenplays [BD-ROM content], Trailers and TV Spot and Image Gallery. Special features for Disc 2 "Hellbound: Hellrasier 2" includes Brand new 2K restoration approved by director of photography Robin Vidgeon, Audio Commentary with director Tony Randel and writer Peter Atkins, Audio Commentary with Randel, Atkins and actress Ashley Laurenc, Leviathan: The Story of Hellbound: Hellraiser II - brand new version of the definitive documentary on the making of Hellbound, featuring interviews with key cast and crew members, Being Frank: Sean Chapman on Hellbound - actor Sean Chapman talks about reprising the role of Frank Cotton in the first Hellraiser sequel, Surgeon Scene - the home video world premiere of this legendary, never before-seen excised sequence from Hellbound, sourced from a VHS workprint, Lost in the Labyrinth - vintage featurette including interviews with Barker, Randel, Keen, Atkins and others, Under the Skin: Doug Bradley on Hellbound: Hellraiser II, On-set interview with Clive Barker, On-set interviews with cast and crew, Behind-the-Scenes Footage, Rare and unseen storyboards, Draft Screenplay [BD-ROM content], Trailers and TV Spots and Image Gallery. Special features for Disc 3 "Hellrasier 3: Hell of Earth" includes Brand new 2K restoration of the Original Theatrical Version [93 mins], Alternate Unrated Version [97 mins], Brand new audio commentary with writer Peter Atkins, Audio commentary with director Anthony Hickox and Doug Bradley, Hell on Earth: The Story of Hellraiser III - making-of documentary featuring interviews with Atkins, Keen and actor Ken Carpenter, Terri's Tales - brand new interview with actress Paula Marshall, Under the Skin: Doug Bradley on Hellraiser III: Hell on Earth, Raising Hell on Earth - archival interview with Hickox, On-set interviews with Barker and Bradley, Never-before-seen Hellraiser III SFX dailies, Theatrical Trailer, Image Gallery and Hellraiser III comic book adaptation [Disc gallery]. Special features for Disc 4 Bonus Disc includes Clive Barker short films Salomé and The Forbidden, Books of Blood & Beyond: The Literary Works of Clive Barker - horror author David Gatward provides a tour through Barker's written work, from the first Books of Blood to the recent The Scarlet Gospels, Hellraiser: Evolutions - a brand new documentary looking at the evolution of the hit horror franchise and its enduring legacy, featuring interviews with Scott Derrickson (director, Hellraiser: Inferno), Rick Bota (director, Hellraiser: Hellseeker, Deader and Hellworld), Stuart Gordon (director, Re-Animator, From Beyond) and others and The Hellraiser Chronicles: A Question of Faith - short film. The limited edition set also includes Exclusive 200-page hardback book with new writing from Clive Barker archivists Phil and Sarah Stokes, 20-page booklet featuring never-before-seen original Hellraiser concept art, Limited Edition packaging with new artwork from Gilles Vranckx, Set of 5 exclusive art cards and Fold-out reversible poster. "Hellraiser: The Scarlet Box Limited Edition Trilogy" hits retail on December 13th.